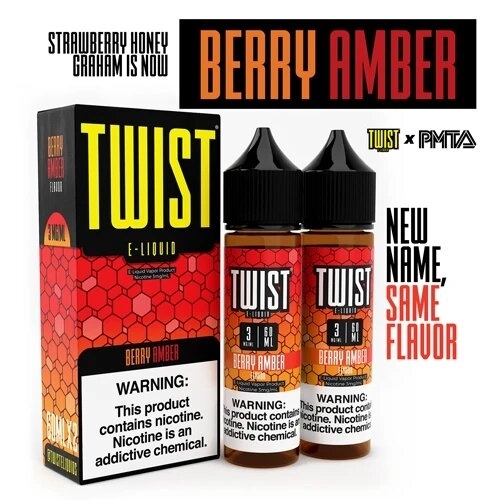 Strawberry Honey Graham Cookie Twist by Twist E Liquid is a masterfully crafted premium vape juice featuring strawberry jam blended with honey drizzled graham cracker for the ultimate sweet and savory vaping experience. Bathe your palate in deep sumptuous strawberry jam flavor followed by honey graham pastry notes for a deliciously fruity dessert vapor that nothing short of perfection. Strawberry Honey Graham Cookie Twist comes packaged with 2 individual 60mL bottles so you can share with a friend. It's so good, you'll probably want to hang on to both of them. Grab one today! Hands down my favorite! Good adv for me.